The one we call the Bard–that is, Shakespeare. Am thankful for the time he was on earth. And one came from a search of my YouTube. but I'll post tweets (unless they're from a rube). But it's hard to stop once you get started on it. "Since many of us will not be residents of this distracted globe when Will’s big 5-0-0 comes around, we should do our best to praise him now, and as often as we can for as long as we can. There is no one like him." "It's Talk Like Shakespeare Day! So, instead of making Much Ado About Wrecking, we're just going to let the Bard himself insult the cakes." found here: Happy 450th Birthday, Shakespeare! 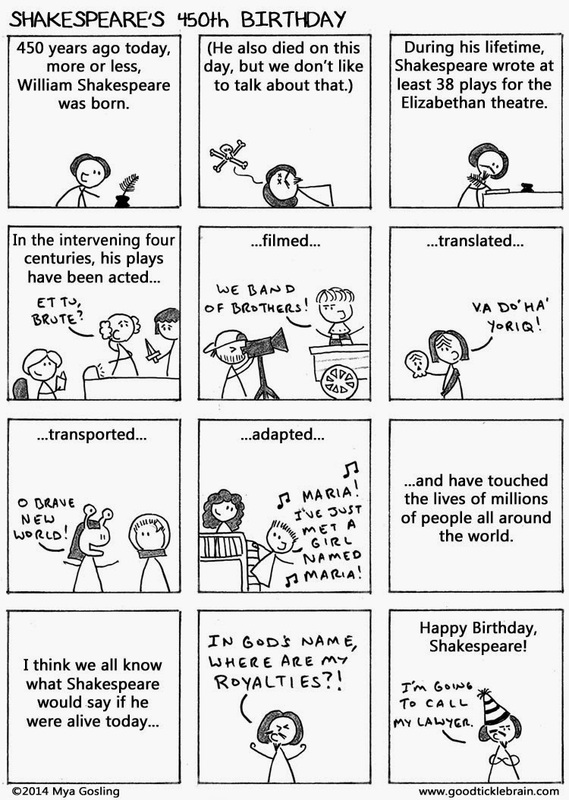 plus many other Shakespeare-related comics--great stuff! You might enjoy Ray Hudson's tweets today: soccer + Shakespeare.